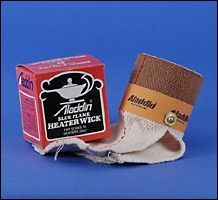 The Aladdin Lamps P159905 replacement cotton wick is a 3" round wick designed for Aladdin Series 8 and 15 models of the Blue Flame kerosene heater line. Quality construction, made by Aladdin UK/Hattersly England. www.p65warnings.ca.gov.